Niche: Helping pool builders live and work anywhere in the world. 1. Where Clayton was before joining the program. 2. The pivotal moment when Clayton decided he wanted to start his own business. 3. How the training helped Clayton identify and solve his niche’s needs and pain points. 4. The specific price Clayton charges for his done-for-you service and the valuable information his clients need. 5. 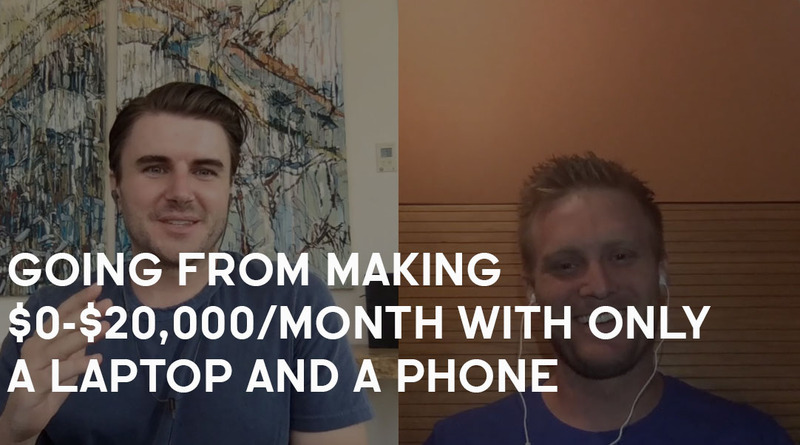 How the sales script and personal connections helped Clayton land a growing number of clients. 6. Clayton’s ten year vision and the innovative new app to track the employees in his business. 7. The one transformative part of Consulting Accelerator for Clayton. Sam Ovens: [00:00:30] [00:01:00]	Hey everyone, Sam Ovens here and today I have Clayton Hawk on with us, and Clayton's got an awesome story and a cool niche. I like hearing about unique niches, and Clayton helps pool builders work or live anywhere in the world, and work anywhere in the world, and continue to build pools, which is pretty cool. And, he does that through coaching and training them and bringing all of their methods and thinking to the 21st century. And we're going to dig into that in the interview and see exactly what that means, how he does it, and all of that stuff. But, Clayton joined Consulting Accelerator around three months ago now. And at that point, he was working in his father's business which was a very successful pool manufacturing business and then he wanted to start his own thing and move out on his own. And so, he joined Accelerator and started his own business helping pool builders build pools anywhere in the world and he's been able to grow it to the point now where it's making $20,000 per month. So, that's some awesome progress, cool niche, fast progress too. So, I'm looking forward to digging into this story and seeing how it happened. Speaker 2:	Sounds good man. Sam Ovens:	So, let's go back to three months ago. What was going on then? Speaker 2: [00:01:30] [00:02:00]	I was at home bored out of my mind. I needed something to do. I needed something to keep me busy and I've always been obsessed with efficiency in companies. And so, I stumbled on your Consulting Accelerator program on Facebook and just kept on, it was very persistent, and I was like, "Man I'm just going to check this out to see what it has". So, I started diving into it, looking at the videos. I was like, "Is this Sam guy really legit". "Where is he from." And so, I started doing all the digging, I was like, "Okay this is the real deal, people are having results". And so, I said, "You know what, screw it, I'll throw my money at it, see what happens", and within the first three weeks I doubled my investment". I was like okay, alright there's something here, you know? Progress started rolling along. I started calling a lot of the vendors I used at the pool company, like marketing companies, HR companies that focused on... [00:02:30] Sam Ovens:	Well, let's slow down here 'cause we're jumping into the whole story in like four minutes. Speaker 2:	Sorry about that. Sam Ovens:	I want to do it in pieces. So, the, you're at home bored out of your mind, but you're working for your dad's business, right? Speaker 2:	Right. Sam Ovens:	So, why were you bored out of your mind? Speaker 2:	I had worked my way out of the company. I had implemented so many processes and systems to run the company for him, that it didn't really require my presence to be there as much. So, it just wasn't satisfying me where I wanted to be. Sam Ovens:	It wasn't challenging you anymore? [00:03:00] Speaker 2:	Right. Sam Ovens:	Got it, and...then did you, what made you think about starting your own business? Did you always spot a need in the market place when you were working in your dad's business or had you always just wanted to be an entrepreneur? What made you think I want to start my own thing? Speaker 2: [00:03:30]	I had always wanted to be an entrepreneur and prior to that I had started other businesses through high school and college, and it's just something I always loved. Just building things. So, yeah I mean it was just something that I always saw myself doing. I just didn't know what avenue to take. Sam Ovens:	Got it, and then you joined Accelerator and what was it that really drew you to it? What made you interested in it? Speaker 2: [00:04:00]	The results I was seeing from other people. I was on Instagram and I'd see your story where yo put like, "Hey this person just cashing checks, cashing checks", people that were just making money and I'm like. I've always been fascinated with the idea of just working for a laptop and a cell phone, and I've never had that opportunity. And I was like okay well at minimum this thing is a better opportunity than what I have in front of me, so. Sam Ovens:	Got it. And then, you joined, and then what happened next? Like you started going through the content, and what did you do? [00:04:30] Speaker 2:	Man, I was fascinated by it. Just your thought process, the way you look at the world, and the way you look at business. That doesn't have to be complicated. You don't have to have this big elaborate marketing plan in the beginning and a bunch of investment up front. It's just simple which that's what I loved about it. It's super efficient as far as starting a business and it getting it off the ground. Sam Ovens:	Got it. Are you an engineer? Speaker 2:	No, I'm not. [00:05:00] Sam Ovens:	Alright. You think like one. You keep talking about efficiency, and waste, and all of these things. That's what I do too. I just look at it and if there's something inefficient it just feels like there's a rodent under my skin. You know what I mean? It has to be dealt with, otherwise I'm so uncomfortable. Speaker 2:	It keeps me up at night. Sam Ovens: [00:05:30]	So, it was simple and you know the first pieces of the program is all about picking a niche and finding a problem, right? Speaker 2:	Mm-hmm (affirmative)- Sam Ovens:	So, did you, like when you saw that what did you start to think about? Speaker 2: [00:06:00] [00:06:30]	When I started thinking about the niche, I changed probably four or five times. Because I didn't know what the need was for the pool industry. I know I wanted to help the pool industry, I just didn't know what the needs were out there. Until you started helping me diagnose, "Okay when you were in that situation, what would you wish you would have had?" And I was like "Okay, well when I was there I wish I had more freedom from the business." What's the point of starting a business if you can't have freedom? You know. And so, I started honing in on what does freedom look like, and the questions you kept asking me throughout the training were just pushing me towards a path that's an untapped market. Where all these guys are starting pool companies with the idea of making money, but they don't understand that unless you can run it from the cell phone that you're holding right now, there's not really a, you're strapped to a desk. It's no different than working in a corporate job. So, that's kind of what I, the niche training helped me understand. Sam Ovens: [00:07:00]	So, what is that. So, obviously they don't just work from home with a cell phone and laptop traditionally. What is the orthodox belief for pool builders. What is the typical? Just explain it to us so we can understand. Speaker 2:	You mean like when somebody starts a pool company or what their [crosstalk 00:07:09]? Sam Ovens:	Well, your typical pool builder and how it's riddled with inefficiency and how it's not just running it from their cell phone. Speaker 2: [00:07:30] [00:08:00]	Oh, most of them are just good old boys. They're contractors. They're usually salt of the earth guys that have either worked in the field, but just don't understand how systems and softwares run businesses so efficiently. And how you can replace inefficient people in the business with an automated system to help lower their overhead and streamline their business, and put in on their phone to run from anywhere. And so, a lot of them think, "Okay I start a pool company. I sold a project. Now, I've got to just call the guys in to come build it". Instead of setting up a system to automate things for them. And, that's kind of what I discovered through going from X amount of projects a year to a lot more, it's like wow you've really got to automate this thing otherwise it's a mess. And so, it's setting them up to scale and their mindsets are very, they're typically more simple minded guys. Sam Ovens: [00:08:30]	Got it. And so, is it usually just them and then do they get an office or do they also a hire a team? What is the actual configuration and organization of your typical good old pool builder? Speaker 2: [00:09:00]	Yeah. So, typically what you have is they're usually smaller offices. They're not big operations. They typically subcontract all their labor out, all their work. They'll have a designer, a couple of sales guys, and project managers in the field. So, it's really not more, most builders I talk to are not more than ten person offices. So, but they do typically end up getting a brick and mortar office for presentations, but I'm also showing them that you don't really need that. People just want, like you say, the result. They just want a swimming pool in their backyard. They don't care about all the accolades on the wall or how big your building is. So, yeah that's typically how builders are set up. Sam Ovens:	Got it. And then, what would you say the problem is? What did you identify the problem to be? [00:09:30] Speaker 2: [00:10:00]	The real root of the issue is time with their families. Because this industry is very different. Contractors start working at about 6:00 a.m. So, you get phone calls starting around 5:30, 6:00, clients don't get home from work until about 6:00 p.m. So, you start getting phone calls all the way from 7, 8, 9:00 at night. Because they're all asking for information that's all in your head. And so, you're quality of life and work life balance is horrific. You just don't have it because you're always on the phone and you go on vacation. You're always on the phone and it's like, there's no break. And so, I realized that when I talk to, 'cause they always end up having me talk to their wife 'cause their wife is involved in the business in some way or another. Sam Ovens:	Usually doing the accounts right? Speaker 2:	Yeah, doing the accounts, marketing... Sam Ovens: [00:10:30]	Probably on the kitchen bench. I know 'cause my dad's a builder. He's retired now, but I know a lot of builders and a lot of tradespeople, and contractors, and all of that. And that's how all of them run it. They don't even know the numbers side at all, it's just wives doing it. Speaker 2: [00:11:00]	Yup, exactly. And so, when I talk to the wives, I'm like, "When was the last time you had a vacation and you had your husband's full attention", and they're typically like, "Well never since we started this business". I'm like, "Well wouldn't that be a nice change", you know? And that's typically what signs them up quick is when I start talking about, "Hey go take six vacations a year if you want to. Have the right people in place to run your business." And that's kind of the part where it draws in the emotion side. Sam Ovens:	Got it. So, they want more life, like freedom and stuff like that. It's not that they don't want the business, but most of doing the pool building isn't actually building a pool. It's talking to people who need pieces of information about the building of the pool? Speaker 2:	Correct. Sam Ovens:	Yup. I noticed that too man, like in all construction, it's still that way. Speaker 2:	Yeah. [00:11:30] Sam Ovens:	'Cause your contractors need to be briefed. You need to make sure they're there, then they're late, then they don't show up and all of that. And then you've... Speaker 2:	[crosstalk 00:11:34] Sam Ovens: [00:12:00]	Yeah, and then you've go the client who always wants to know all of this stuff and then sometimes the person doesn't know so they've got to ask the contractors, and you've got basically one central source here. And then, all of the nodes coming off it and it's just all routing through one individual, or two individuals which would be the wife if the husband's on the tools building, then it all gets routed through the wife. And then, if he's not building it can go through both of them, you know what I mean? Speaker 2:	Right. Yup. Exactly. Sam Ovens:	It's such a simple set up, but I guess it works well at small scale and then as soon as you add a little bit scale it just explodes right? Speaker 2:	Right, exactly. Once you hit 100 pools a year, which is where I'm trying to get a lot of my builders. I find them in the 50 to 60 pool a year, where they had that desire, they want to break that three figure pool or they want... Sam Ovens:	Three figure pool, that's a cool thing to say. [00:12:30] Speaker 2:	Yeah. So when they break 100 pools a year, that's when it's like you either nut up or shut up. You've got to get your systems in place, you can't run it like a good old boys show anymore. Sam Ovens:	But, it's like a pool every three days. Speaker 2:	Mm-hmm (affirmative)- Yeah, we got into we're building a pool a day. So, it was definitely a machine. Sam Ovens:	Got it. So, these people want to keep building pools. They love it. Do you find that they love it? Speaker 2:	They do. They really do. [00:13:00] Sam Ovens:	What is it? You said that you liked the industry too. What is it about building pools that makes it a love affair? Speaker 2: [00:13:30]	It's the design aspect and seeing that design come to life. Like I said, I've always built things. I've always loved building things. And so, from cars, to motorcycles, to whatever it is, businesses. And, I just started designing. You design this incredible project and then you see it put to life in the field, and it's like man that was cool, that was cool seeing that all come together. And so, that's kind of where the true passion comes from. Sam Ovens:	Got it. So, a lot of the time are these people sort of generalists like builders or whatever and then they fall in love with the specialty of pool building? Speaker 2: [00:14:00]	Well, most stories I hear, 'cause I always ask them how they got started, you know? And they're like, "Well I started building fences and then someone asked me to build a roof structure for them. Then someone asked me to build a fire pit. And then, I was like well heck why don't I just build your pool for you?" And then, they decide like wow this is really cool, I love doing this, and then it's a trickle effect. It's almost like a gateway drug to building pools like you start out with one aspect of it and then it just grows to the rest. Sam Ovens:	Yeah, it's funny how that happens. Speaker 2:	Mm-hmm (affirmative)- Sam Ovens:	'Cause I guess you do get to be, I mean it would be to me anyway more exciting to build a tool than a fence. Speaker 2:	Yeah. Sam Ovens:	You know what I mean? Speaker 2:	Yeah. Yeah. Mm-hmm (affirmative)- [00:14:30] Sam Ovens:	And then, so you spotted this thing and then what made you believe that you could solve it? Speaker 2: [00:15:00]	Just that I had done it before and I had seen how well it works to where I was able to take a vacation and not get a phone call. I'd maybe check my email once a day if needed. I started realizing wow we're building a pool a day and I'm not getting any phone calls. I can sit here and engage with my family and be home early to go see my daughter have a dance recital or something like that. It's like man, this is, it's working. And, employees were happy, they felt very efficient with their positions and is just, it worked. And so, I was like well if I can do it here, why can't I go do it to other builders? Sam Ovens:	So, you knew it could be done because you had done it at your dad's business, and how many pools did you get up to a year? [00:15:30] Speaker 2:	About 325. Sam Ovens:	So, you guys are like the Michael Jordan of pools kind of? Speaker 2:	Surprisingly enough there's guys building over a thousand, like publicly traded coporations. Sam Ovens:	Well, I guess for a private business it's pretty big. Speaker 2:	Yeah, for a private business it's massive. Sam Ovens:	Got it. So, to the average pool builder, they would look to you and be like, "Yeah, you know what you're doing. I want to learn some of that." Speaker 2:	Right. [00:16:00] Sam Ovens:	Got it. That makes sense. And then, what happened next? Speaker 2: [00:16:30] [00:17:00]	So, I discovered this niche and I discovered there was a need. I talked to a Houston pool builder that I knew, and next thing I know I go through the sales script and he goes, "Okay, well when can you come down and get started". And so, I got going, and I got him set up, and boom the first check came in, or credit card payment came in. And I was like, "Okay well this is working, there's a need here". So, I started calling the vendors that I knew that also worked with pool builders and just asked them where they saw issues. And, started discovering more that it wasn't, the marketing guys had issues with, that they would pump so many leads into these pool companies, but the pool companies would have to shut them down or back off on their budget because they couldn't build them fast enough. And so, the marketing companies loved me because they'd get me in there, and I'd make their processes incredibly efficient, and run well, and they can increase their marketing budgets because their companies run well. And so, now I have these marketing companies referring me out to these pool builders because it's something they don't even want to mess with. They just want me to come in there and help increase their marketing budget. So, it's a win win really for everyone in the industry because there's now one doing it and everyone sees the issue. [00:17:30] Sam Ovens:	So, as soon as, so a new builder, they're immediate problem might be getting a client, right? Speaker 2:	Right. Sam Ovens:	Which is kind of a marketing sales problem, but as soon as they solve that one, and they get some clients, the next immediate problem is operations, the delivery of pools to people. Speaker 2: [00:18:00]	Mm-hmm (affirmative)- Correct. And these pools these guys are building are incredible projects. I'm talking I mean quarter of a million dollar back yards. And so, they're fire features, and dancing fire shows on top of water, and just some of the most wicked cool stuff you'll see. And so, it's not like it's just slice and dice projects, these are like really high end custom pools that we're dealing with, so. Sam Ovens:	Got it, and do you find that the marketing or the getting clients for pool builders is much of an issue or is more the operations? [00:18:30] Speaker 2:	I think getting clients is the hard piece for them. I think it's a really hard piece because you don't have to talk anybody into buying a pool, everybody want's a pool. It's competing against everyone else out there. Sam Ovens:	Unless they live in Russia. Speaker 2: [00:19:00]	Unless they live in Russia. Right? Yeah you don't want anything out there unless it's covered or indoor. So anyways, that's a big issue, but once they get them, it's kind of windfall because you put a sign in someone's front yard, and people see a pool being built, and they got 800 neighbors around them in a neighborhood. They're driving by that sign everyday. That's where you start getting referrals and people start calling just based off that sign in the yard. And so... Sam Ovens:	Have you noticed that like, 'cause this is already starting to make my brain start thinking about. 'Cause you could ultimately I can see you handling both sides of this, you know? The marketing and the operation. Showing them the full stack of how to do it. You know what I mean? Speaker 2:	Mm-hmm (affirmative)- Sam Ovens: [00:19:30]	'Cause right now I get it that you're just focusing on this piece, you're giving the other piece to the agency, but... you could do probably a way better job than the agency. You know what I mean? Speaker 2:	Right, yeah, and I've tossed that around a little bit. I just don't understand that piece of the business well enough. When I was working with my dad, we always outsourced that. And so, but yeah that's a big piece and we've got... Sam Ovens:	Do they usually cluster like if someone gets a pool in a neighborhood, other people start getting pools in the neighborhood. Speaker 2:	Yeah, oh yeah. It's a keeping up with the Jones's thing. Sam Ovens: [00:20:00]	So, then it would be, you should hire like a data scientist or something and get them to just use Google Maps and do an image recognition thing of pools in the neighborhoods and it will probably spit out a probability of these clusters where pools are likely to be. Then you could target those with advertising. You could target those geographic coordinates. Speaker 2: [00:20:30]	Mm-hmm (affirmative)- And you can also base it off of how much the household income is in an area, you know? 'Cause that's a big deal. And home values is a big deal, 'cause people are going to spend typically 20 percent of what their home is for it. Sam Ovens:	Yeah, well this thing could read the back yard size or the front yard size, could spot nearby pool and home value, and climate, and time of year, and all of these variables and spit it out. And then, you could just target those people. That would be something seriously better. Then the agencies don't have one of those, you know what I mean? Speaker 2:	Mm-hmm (affirmative)- Yeah. Sam Ovens:	And that's actually possible by the way, that's not even that hard to do. Speaker 2:	Really? [00:21:00] Sam Ovens:	Yeah, like that is easily possible, because Google's gone and done all the satellite mapping. Speaker 2:	Mm-hmm (affirmative)- Sam Ovens:	So, all you have to do is hook into that API, and have a good algorithm to [inaudible 00:21:09] it all. Speaker 2:	That's a good idea, I didn't even think about that. Sam Ovens: [00:21:30]	Because it's very easy for a image recognition algorithm to spot a pool because it looks...you know when you look on Google Maps at pools. It's not very hard, it's not like trying to spot a particular type of tree, you know what I mean? It's very easy to spot that. So, the pattern recognition thing would spot it and it could localize those clusters based on the other clusters of pool areas. Spot those. Figure out everything. 'Cause all of that data's online. You don't have to get the data, it's all there. You just need something to add up and compute all of that. Speaker 2: [00:22:00]	That's interesting. I never even thought about that. Yeah, I could look into that man. That's something pretty interesting. I still have yet to dive heavily into the Facebook advertising piece of the consulting program and I'm getting ready to. And so, I'd be interested to see how all that works, 'cause I never understood it. Sam Ovens: [00:22:30]	The reason why I thought of that is I know that some of the big solar companies have algorithms like that right? They can solar clusters too. If someone else sees that someone else has solar panels, then it makes them curious, and they're more likely to do it. And then, also based on the angel of the roof, and how it receives sun based on where it's positioned in the angle, and all of those, and the climate, the value of the property, and the presence of other solar things. And it can compute it all and it spits out the addresses. And then, it sends post cards, just full machine, yeah. Speaker 2:	That's insane. Sam Ovens:	Yeah, there's things like this that exist. That's what gave me the idea for the pool one. Speaker 2:	Yeah. I didn't even think about that. That's pretty incredible actually. Sam Ovens:	And it's not that hard honestly. One dude, one really smart dude, could figure out an algorithm for that. [00:23:00] Speaker 2:	Mm-hmm (affirmative), A data scraper. Sam Ovens:	It's not a scraper, it's just an algorithm. 'Cause the data's there, you don't really need to scrape it, and you can get access to it. You just need something to compute it, and crawl it, and figure it out. Speaker 2:	Mm-hmm (affirmative)-Yeah that would be pretty cool. Sam Ovens:	That would be next level man. That would be really taking these good old boy pool builders with their wife doing the books to the next level. You know? [00:23:30] Speaker 2:	I'll have to tell them, "Hey you can actually hire a bookkeeper now". You know? Sam Ovens:	So, we got a bit off track, but that's the immediate thing that was popping into my head. That would be cool. Speaker 2:	Yeah. Sam Ovens: [00:24:00]	And then, how did you go about...So I get it, you found this niche, which you're passionate about. You saw this problem they had. You knew you could solve it because you had already solved it in your dad's business. And then, you...like how did you think how I'm going to price this thing, and how did you think how am I going to deliver this information to these people? Speaker 2: [00:24:30]	So, pricing was, yeah that's like the loaded question in anything, you know? And so, I'd asked the first couple of builders that I knew, and I said, "What's this worth to you". They say, "Well it's priceless". I'm like, "Well that doesn't really help me figure out my price". I understand there's a personal aspect to it and I started thinking about how much we made on building pools and how much you can make building 50, 60 projects a year. And I was like, well if I can increase your business to 100 pools making this much a year, I just took a percentage of that. And I was like, well it could be about 30 grand easily. You know? And so, I was like okay how do I split this up where I'm not hitting them with a big price tag of 30 grand. It was like well it takes about six months to do this, let's split it up over six months. You know? And I'd give them a month off if they sign up that day. So, potentially five grand off or whatever it is, yeah five grand. Sam Ovens:	So, what's the total investment? [00:25:00] Speaker 2:	The total investment is about $24,000. Sam Ovens:	Split over how much... Speaker 2:	Six months. Sam Ovens:	So, how much is that a month? That's what... Speaker 2:	Four grand. Sam Ovens:	Four grand. Four grand a month. And then, how did you, why did you choose that? 'Cause people are listening and might be like, "Oh maybe I should do 24 grand over six months". You know what I mean? How did you come up with six months, and that price, and paid monthly like that? Speaker 2: [00:25:30] [00:26:00]	Well, I knew that with me doing a lot of the work for them, setting up softwares, I only have so much time in the week. And so, I knew I needed to make a certain amount to live a healthy lifestyle. And so, and I looked at also what the value I'm bringing to them, and if you would have told [inaudible 00:25:47]. And I whenever we were working at the previous pool company that for 25 grand I could make 90% of your issues go away then I wouldn't have thought twice about it. And so, that's why I came up with the number. I was like, "Okay well it's what I'm bringing to them and how much they're making, and how much they can spend money to make problems go away". And so, yeah that's how I kind of came up with it. Sam Ovens:	And so, right now you're doing like done for you. YOu're signing up a client and you're doing it for them and everything. Speaker 2:	Right. Sam Ovens: [00:26:30]	Got it. Alright, that makes more sense. So, it's not a program yet, but you're doing done for you first. 'Cause ultimately once you really master it, figure out all of the patterns, and figure out the most efficient, simple, clear way to communicate it. Then you can put the burden of setting up software on them. You know what I mean? Speaker 2: [00:27:00]	Yup. Mm-hmm (affirmative)- Yeah, that's the main goal is setting up and everyone of these software companies I've partnered with to where every builder I sign up, they write me a referral, unending until they cancel their services. And so, I make sure that I partner with the softwares that I think are the best. And so, I'm essentially selling for them. You know? 'Cause I kind of got into a set where I was making other people millionaires and I was tired of it. And I was like, "Well I'm not going to make anyone else a millionaire without making myself one first". And so, I started calling the different software companies and all the vendors I was using to get these builders set up and they were all really cool with it. Most of them didn't argue. Sam Ovens: [00:27:30]	Yeah. It's the same with us with Accelerator. We recommend some software to these people and we get part of the money back. It's still important that you never let the money that you make from that cloud your judgment in the choice of tool. You know what I mean? Speaker 2:	Correct, yeah. That was the biggest piece is I'm not picking guys just because they're saying yes to me. It's like there's two of them that didn't say yes to me, but I still use them because I think they're the best. Sam Ovens:	Yeah, that's, for people listening if you ever mess that one up, kiss your whole business good bye. Speaker 2:	Because you're putting your clients behind. [00:28:00] Sam Ovens:	Your own want for money, which is so messed up you know? Speaker 2:	Yeah, that's not the way to do it. So, I just figured if there could be a partnership there then why not? But, there's one software that I use, it's like, they're like, "No, we don't do partnerships". I'm like, "Well, I'm still going to use you guys, 'cause I know you're the best, but it's worth me asking", so. Sam Ovens:	Got it. And then, why the six months thing? Does it take you that long to set it up? How did you come to that term? [00:28:30] Speaker 2: [00:29:00]	When I started listing out my process and this is kind of my engineer side coming out, I started listing out how this was going to work. It needs to be in baby steps. It wasn't something that you come in there and just unload everything on all the employees. And then, you have employees quitting left and right. They're not, they don't like change, and no one likes change. It's just how you present it to 'em. And that's one thing I noticed when I Skype with the employees and talk to them. I make this their idea. It's not my idea. I'm not the expert coming in. I just start asking them questions. "Okay. So, where do you see an issue here. Okay. Why is that an issue and what are some solutions you think that would solve that issue. Here's three I thought of. Which one do you think is the best." And there's obviously one of them that's obviously the best, but I want them to think about that. I want them to come up with solution. So, when I go and implement it, they take ownership of that idea, and they're able to go and tell the other people, "Hey this is an idea I came up with". [00:29:30]	And so, it's like it's all about how you present it and that timeline takes that much time to spend with those employees and make it their idea. 'Cause if you go in there and just say, "Hey here's a new system, use it, this is the way it works, go". You're going to have people quit, I did when I was working at my dad's company. I implemented a software and two people quit because they hated change that much, and I was forcing it on them as opposed to making it their decision. [00:30:00] Sam Ovens: [00:30:30]	Yeah, what I've found is that when you tell someone what to do, they think, "Why should I listen to him. He's just telling me to do this", but if you make it not about individuals or people but about the mirrors of the idea, right? So, it's like "Here's what we're currently doing, here's what's wrong with it, here's what I think we should do because it solves this, and its better than that way. There's all this upside, there's no downside, like what do you think?" And then they're like, "Yeah this is way better", then its like, "Well shouldn't we do this". Yeah. It's not about like a personal power thing. It's not like imposing rule on someone. It's more like, this is better so it would be in everyone's best interest to do the better. You know what I mean? Speaker 2: [00:31:00]	Yeah, that's another way to do it too. It's just how you present it. I know it's not so much what you're delivering. It's the package you deliver it in. So, it's kind of neat seeing it unfold, but eventually I'd like to, like you said, figure out how to streamline this and figure out the pieces of it to where I don't have to do it for them. Sam Ovens:	It'll happen to you, it'll just take like...I mean you've only been doing for like three months. I think after about one year, it'll just be so blatant to you, you won't even think how would I do this, you'll know. 'Cause after you've seen something enough times, it reveals it's patter and it's sequence of events. You know what I mean? And then, you just know it off by you know how to turn it into a machine. Speaker 2:	Right. Yes sir. [00:31:30] Sam Ovens:	So, how did you go about getting these clients? Now that we know what your offer is, the niche, the problem, the solution, how did you get your first one? Speaker 2: [00:32:00] [00:32:30]	The first one was just a friend of mine in Houston. He was a pool builder and he heard me speak at a conference of pool builders talking about automating your business when I was working with my dad and just said, "Hey I really enjoyed that talk you did two years ago". And I didn't hardly remember doing it, and he just said, "Would you mind setting up some systems for me". So, that was my first client. After that, it was me reaching out to our marketing guy and discovering the issue. And him having to clients in Austin that needed the same help and getting on the phone with them and the sales script was like cutting butter man, it was awesome. And so, I started talking to those builders and I signed up two more down in Austin. And then, it's just kind of been a windfall since then. Sam Ovens:	Nice. And so, you use your personal connections and all that. And then, what's next for you? Like you've got how many clients right now? Speaker 2:	Five. Sam Ovens:	Five paying four K each. So, 20K? Speaker 2:	Yup. Sam Ovens:	And what's your next step and what do you spend most of your time doing now? [00:33:00] Speaker 2:	Setting up softwares. That's where the majority of my time is going. So, I've go to figure out a way to still keep myself, the gateway to setting it up and everything, but start educating and teaching the builders how to do it themselves. And, take it to where I'm not sitting in front of a computer all day setting up softwares. Which I don't mind doing, it's just how do I... Sam Ovens: [00:33:30]	So, what do you have to do? What sort of, you don't need to name the exact things, but what are these sorts of tools, and what are you loading into them, and what are you basically setting up for them? Speaker 2:	I'm setting up their whole process and system the way it needs to work. So, from the time the customer walks in that front door, signing contracts, to swimming in the pool. What are the processes? How do you communicate to them? How do you use your software to communicate better to them? Where you don't get that phone call at 6:00. Sam Ovens:	What is the typical phone call if you had to find the 80 20 presenting phone calls from client to pool builder, what do they want to know? [00:34:00] Speaker 2:	What happened yesterday? What's on the plan for tomorrow? Sam Ovens:	So, they actually want to know daily updates. Speaker 2:	Not all of them do, but a lot of them do. And it's like... Sam Ovens:	Can't they just look in their backyard and be like oh yeah that moved? Speaker 2: [00:34:30]	Yeah. Yeah. But, it's...I don't know it's tough because they always want to know future stuff. It's hard to give them future stuff but it's the way you tell them the future. It's like never give them exact dates. That was one thing I always have to harp on them. Always give them generals. Like, "My goal is to get X, Y, and Z done next week". "Well, what day?" "I don't know. I'll let you know when they show up.". It's like having those expectations set and how to do that automatically through a software with an automatic email as opposed to having to make that phone call every single time. Sam Ovens: [00:35:00]	When people do that to me I'm like, "Do you want me to lie to you", and they're like, "No", and I'm like, "Well stop forcing me to lie to you". You know what I mean? I'm trying not to. So, don't do this, because I don't know so if I make something up, it's not good for either of us. You know what I mean? Speaker 2:	Yup. Sam Ovens:	And what do you think is the reason behind their question? Because someone will have to have this thought or this emotion or something that drives them to then as these questions on the phone to this person. [00:35:30] Speaker 2: [00:36:00]	Well, it's kind of funny how it works. So, the home is the identity of the wife typically and the pool is an extension of that identity. And so, they're emotionally attached to this project. The man's like, "Okay, how much does it cost? What are my payments?" They're very cut and dry typically. So, it's a 90 percent female based decision. So, when you have the wives that are, they typically aren't the confrontational ones. Not always. Sometimes they're not the confrontational ones. So, typically it's the husband calling on behalf of the wife saying, "Hey when's this thing going to be done and when can my kids be swimming in it?" And so, they break it down, okay when's this next phase happening and those are... Sam Ovens:	So, they're mostly concerned to get it done, 'cause they want to swim? Speaker 2: [00:36:30]	Yeah, and my biggest thing is like hey I'd love to drop it in with a helicopter, done, but it's custom pool. There's not a easy way to do this. So, it's...tough. All they want is it done. They just want to be swimming. They want you out of their back yard. Sam Ovens:	Do you know what would be cool? Is if there was a little software thing that the pool builder could update daily and it just gives a percentage. Like, you know in the Accelerated Program as you go through it shows you how many percent you're done? Speaker 2:	Mm-hmm (affirmative)- Sam Ovens: [00:37:00]	And then, based on that it could calculate date range of estimated completion date in between these. And obviously it can move, but you're basically giving them the day amount so they won't automatically put out the call. And it updates everyday. You know what I mean? Speaker 2:	Right, the percentage, yeah. And that's actually... Sam Ovens:	And from the percentage it can calculate the date range. So, it says, "We're this much complete, and based on that we estimate to complete between this date and this date. Obviously, this is not guaranteed. This is just what you want, these ranges all the time." But, this is a little thing, and this wife can basically just watch it all day if she wants. Speaker 2:	Yeah, watch the percentage move every time somebody comes and leaves the back yard. [00:37:30] Sam Ovens: [00:38:00]	'Cause I always think how can we eliminate the source of the person asking the question. You know what I mean? It's not answering questions. Answering questions is the lame way to deal with it. I like that saying where it's like...A good factory sweeps the dust out of his factory everyday, right? And keeps the floor clean. And then, but a master will seek to eliminate the source of the dust. Speaker 2:	Mm-hmm (affirmative)- Sam Ovens:	Because then they don't have to sweep it anymore, it's gone. You know what I mean? So, instead of just dealing with the symptom, by having a system or a human being hired and trained to handle the calls, why don't we just eliminate it by just putting a little thing up. You know what I mean? Speaker 2: [00:38:30] [00:39:00]	Well, and that's kind of what I'm about to release. I'm talking about it pretty minimally, but I have a app that's about to be done in about three weeks and it tracks the employees or the contractors going in and out of the back yard, and automates scheduling. And it will tell them exactly what this is. Like, "This guy came in last, you have this much more left". And it's just, all it's doing is tracking cell phones walking in and out of the back yard. And so, that's something that's about to come out that I realized there was an issue with the project manager having to go, and check, and see what was done, schedule the next thing, and go. It's like, what a waste of time for him to drive out there, just to see if something was done. And then, have to come back, and schedule, and make phone calls. Why doesn't it just automate that? Sam Ovens:	Yeah. Speaker 2:	So, it's a very archaic industry. Sam Ovens: [00:39:30]	Yeah, well you've got multiple dimensions to it. So, like one dimension you've got the internal project management. You know what I mean? The contractors, their tasks. And then, also the pool builder. But then, you've got the other dimension which is the wife and the husband wanting to know, being kept in the loop. Speaker 2:	Can I drop in? I have to run to the restroom real quick. Sam Ovens:	Cool, that's fine. Speaker 2:	Alright cool. Sam Ovens:	So, what's next for you? What is your mission and vision with this thing? Where do you want to take it one year, ten years from now? Speaker 2: [00:40:00]	Man I want to break a hundred grand a month. That's my current goal is I want to figure out how to do that because that would be obviously a game changer for me. And I want to be able to do this thing from anywhere in the world, which that is the beautiful thing about your program is that you can close people over the phone, you don't need to be with a person. So, my end goal is a hundred grand a month right now, and I want to automate this to where I can teach pool builders how to do it themselves. Sam Ovens:	Got it. Cool. Speaker 2:	Mm-hmm (affirmative)- [00:40:30] Sam Ovens:	And what would you say has been the one most transformative part of going through the Accelerated Program? Speaker 2: [00:41:00] [00:41:30]	I don't think it's one specific part. I think it's more just given me confidence that you can run a business from a computer and a phone and you don't need a ton of moving pieces all the time. You can simplify things. And so, I think the mindset, out of all the training, was the most valuable piece for me. Because I was at a very low point in my life when I found the training program. I had left working for my dad and just had time where I didn't know what I wanted to do next. And so, I was almost depressed. And so, that mindset is what I needed to start forecasting. Okay, who do I want to be in this many years? What do I want to look like? What do I want to wear? How do I? That was like, why am I not thinking about this stuff. And so, that's what kind of got me out of my seat a little bit more, and I personally think it's the most valuable piece of this training program. Sam Ovens:	Awesome. Speaker 2:	Yeah. Sam Ovens:	And you've been in the community and seen other members and how they're going through the program. What would your number on piece of advice be for them? Speaker 2: [00:42:00]	Don't give up man. You've got to enjoy the process. Because if you don't enjoy that process and you're only looking for the result, you're not really...You're not going to be satisfied with it. And, I see so many people give up in business all the time and it's like you're literally right there. You're almost there, just get through that final five percent and you're going to be there. That's where people usually drop the hammer and stop working. And so, just to not give up man, and keep pushing, and trust the process. Sam Ovens: [00:42:30]	That's good advice. Cool, well thanks for jumping on and sharing your story with me. And if people are watching and they're like, "I want a pool", of if any pool builders are watching and they're like, "I want to work from anywhere and get to three figure pool status". How do they learn more about you? Speaker 2:	So, on my website, where they can go in there and schedule a call with me. Is ThePureConsultant.com. That's where they can access everything and be able to see kind of more of what I do, and who I am, and how to get ahold of me. Sam Ovens:	Awesome. Cool. Well, thanks for jumping on and sharing your story. [00:43:00] Speaker 2:	Cool. Awesome. Thanks man. Sam Ovens:	Cool. See you. Speaker 2:	Alright.